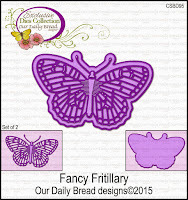 I've got another sneak peek of some new stamps and dies that will be released on June 1st at Our Daily Bread Designs. 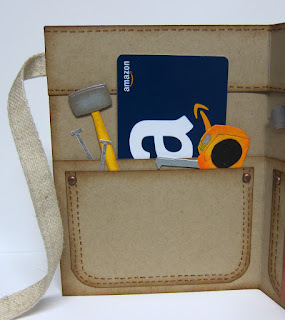 After seeing a similar tool belt idea on Pinterest, I created my own pattern and first cut a piece of 8 1/2" x 11" kraft CS in half so it would fit into an A2 size envelope. The long band along the top was adhered with 1/4" score tape - positioning it over the burlap ribbon (SU). 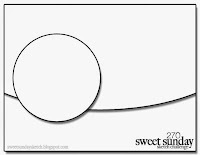 This can be tied in a bow when the card is closed. This makes a perfect masculine gift card holder. I'm also playing along with Just Us Girls where it's Wild Card week and we're challenged to do some paper piecing. Several of the tools are paper pieced. I doodled some stitching details with a brown Tombow marker and sponged all the edges with Vintage Photo distress ink. STAMPS: World's Greatest (ODBD) - to be released June 1. PAPER: Vintage Cream and Kraft by PTI; Crushed Curry by SU; Metallic silver CS. INK: Soft Suede (SU), Vintage Photo distress ink (Tim Holtz). ACCESSORIES: ODBD Custom Tool Time Dies; ODBD Pennants Dies; Corner rounder; Burlap ribbon; Copper brads. The June release at ODBD is just around the corner and today I'm giving you a sneak peek at some new stamps, dies and papers that are perfect for the handyman in your life! The Free 4 All Challenge on SCS is to "Honor Thy Father" where our card is to show something our dad likes or something about his personality. My dad was a super handyman! He could fix nearly anything and he had a workbench area with many tools. Aside from repairing things, he also created wood items - frames, small tables, benches, sleds, pens, etc. You can see why I love this release because it fits my dad so perfectly! He is in remarkable good health and is still very active and will turn 89 years young on June 15! We are blessed! A bit more about my card...The 2 patterned papers are from the new Vintage Ephemera Collection. 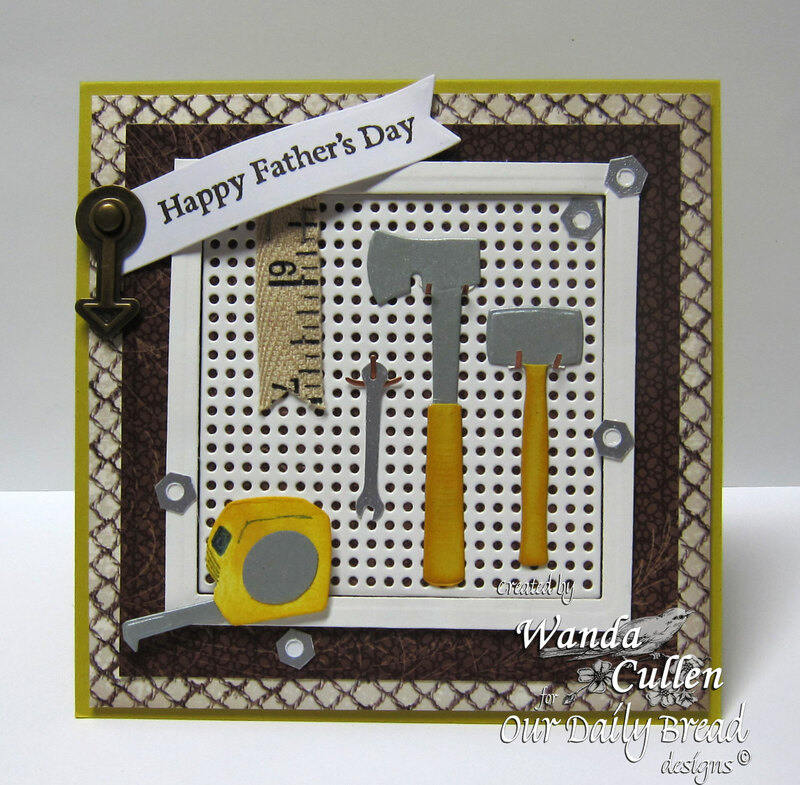 New dies include Pegboard and Hooks and Tool Time dies and the sentiment is from a new stamp set called Father's Day Tools. The tiny nuts - from World's Greatest stamp set - were silver embossed and fussy cut and punched to add as embellishments. Ways to Use It - use favorite tool. I would say my Big Shot is probably my favorite tool since I love using dies on the majority of my creations! 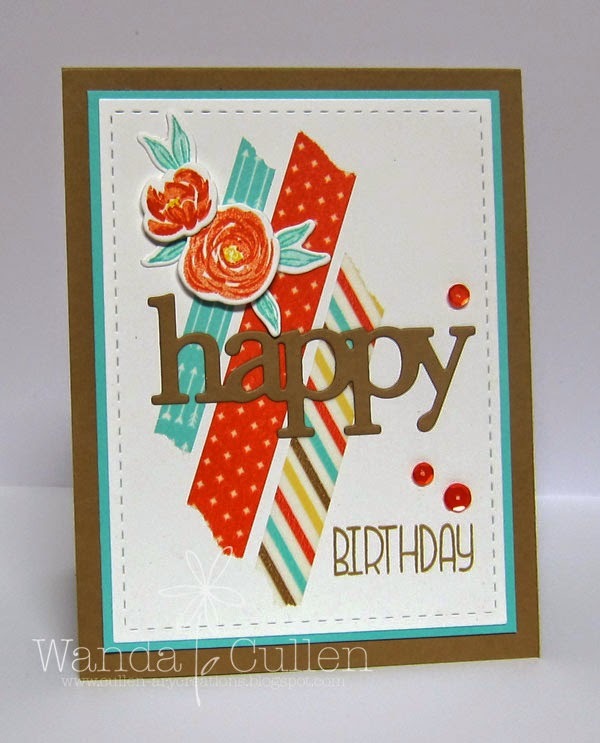 This card uses the Diagonal Stripe Pretty Panels Confetti Cut by Reverse Confetti, Spring Blooms dies by WPlus9 that coordinates with the stamp set by the same name, and my fave Stitched Mats: Rectangle die by Lil' Inker Designs. 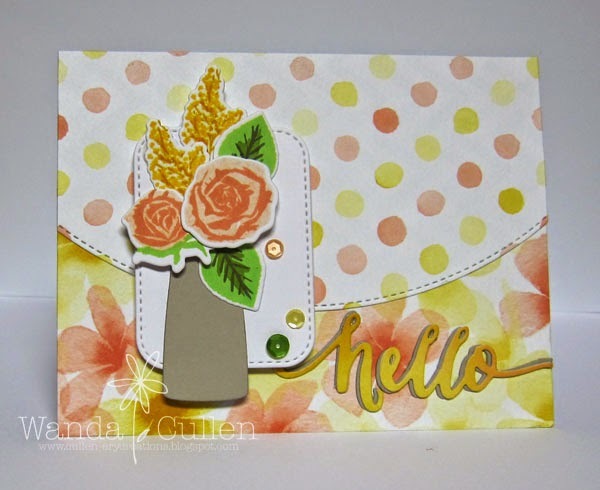 STAMPS: Spring Blooms (WPlus9), Banner Blast (SU). PAPER: Coastal Cabana (SU), White (PTI). 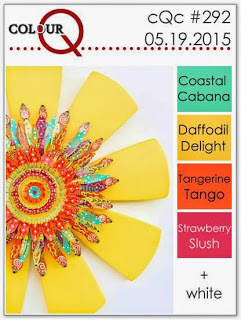 INK: Coastal Cabana, Daffodil Delight, Tangerine Tango, Strawberry Slush. 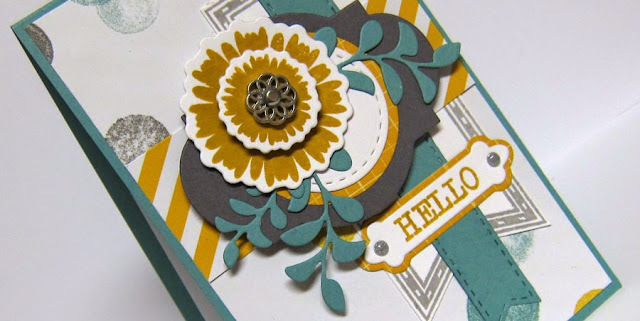 ACCESSORIES: Spring Blooms dies by WPlus9, Diagonal Stripe Pretty Panels die by Reverse Confetti, Banner punch by SU, Silver button by SU, Stitched rectangle die by Lil' Inker Designs. Wow...this month is nearly history and I can't believe this is already the last Wednesday of May! 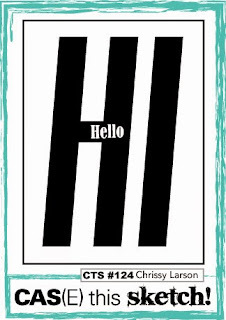 I want to thank Tenia Nelson for graciously guesting with us this month! She rocked the colors every week! Stay tuned next week to find out who our June guest designer will be! 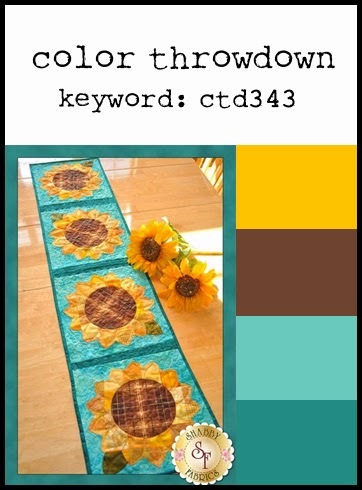 Vickie has chosen some beautiful, soft summery colors for the new Color Throwdown challenge! When I first saw the photo, I thought the pink had some coral tones in it, so chose to ink up the 2 step roses using Miami Spice ink by WPlus9. 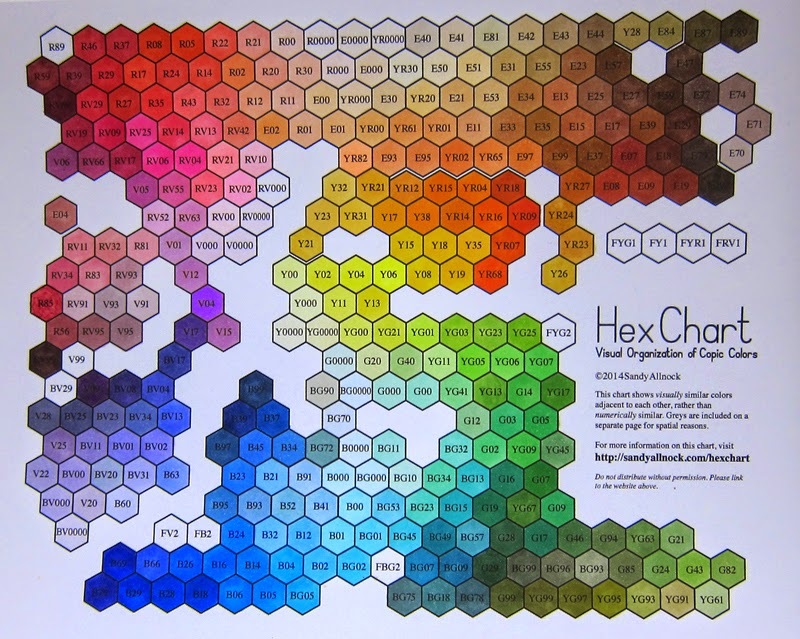 It seemed to match this designer paper (it was gifted to me so I'm not sure of the source). Sketch Challenge - perfect for trying out my new MFT Die-Namics: Stitched Basic Edges and the Stitched Rounded Rectangle STAX. The vase and florals are dies by WPlus9 which coordinate with their Coming Up Roses stamp set (oops...I see they are out of stock at this time). 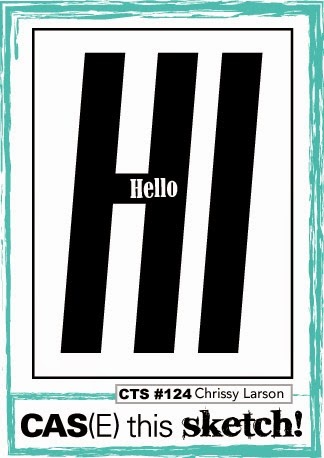 The sentiment is the Hand Lettered Hello die by WPlus9. 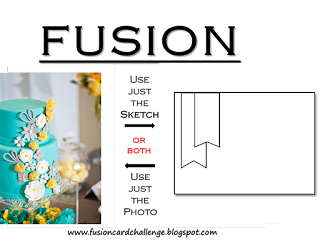 Congratulations to Kirsty McIntyre from Purple Place Designs who was randomly chosen to be our Guest Star Stamper this week! Vicki has chosen Very Vanilla, Coastal Cabana, Old Olive with the dessert choice to use black for the new Color Challenge on SCS! I went with a very simple design using Reverse Confetti cuts and stamps. This is very self explanatory, so I'll get right to the enabler's list! STAMPS: Petals 'n Posies (Reverse Confetti), Circle Sentiments (Reverse Confetti). PAPER: Vintage Cream (PTI), Coastal Cabana (SU). INK: Coastal Cabana, Old Olive, Daffodil Delight, Versafine Onyx Black. ACCESSORIES: Petals 'n Posies, Triple Chevies, Scalloped Circle Confetti Cuts by Reverse Confetti; Stitched rectangle die by Lil' Inker Designs. 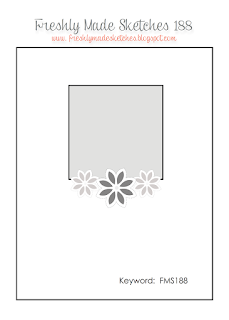 I just had to bring a "May flower" to my card and went with the SU colors in their "Moonlight" paper stack: Basic Gray, Hello Honey, Lost Lagoon, Whisper White. My card dimensions are 3 1/2" x 5 1/2". This is pretty self explanatory, so I'll get right to my product list. STAMPS: Bloom and Grow (flower), Remember This (banner and sentiment) - both by Verve. INK: Hello Honey, Smoky Slate (thanks to my new Basic Gray pad being too dry to use - GRRR!). ACCESSORIES: Verve dies included Charming Banner, Sprightly Sprigs, Classy Label Die, Floral Circles; Enamel dots by MME; Silver filigree brad by SU; Stitched Fishtail Flags Die-Namic by MFT. Are you ready for more inspiration? 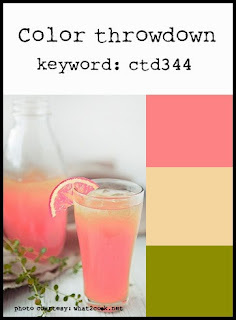 Check out the rest of the mojomakers' creations by clicking on their blog links below...or... you can go to the Mojo Monday blog and the first 8 thumbnails will be the design team's cards. I was creating in the wee hours of the morning after getting off work last night... wanting to play along with the unique sketch over on the CAS(E) this Sketch blog! I was also thrilled to see a good cyber friend - Petra - as their guest designer. I'm a big fan of her card making style, so a big congrats to her! I'll have to say I was stumped at first with knowing what direction to take with this design, but this is what I finally came up with! I don't have any huge letter dies, so went with washi tape for the slightly angled element. Had some extra Pretty Little Peonies (WPlus9) die cut flowers and leaves from a previous project, so quickly did some 3 step stamping and popped them with foam dots. Baked Brown Sugar and Coastal Cabana CS (SU) was used to layer the main panel. The sentiment is from WPlus9's Whole Lotta Happy set. It's a day off work for me and I plan on traveling across the mountain to a berry farm to "pick" some strawberries again. No...I won't be on my knees. I'll be picking the basket up off the table - lol! Tonight I'll be going to the memorial service for a nurse who worked 2nd shift with me. She tragically took her life after severe depression set in while coping with a lymphoma diagnosis. This has really taken the wind out of us at work to say the least! To walk in one day and have this told really blindsided us all! I'm a crier, so this service will be a difficult one. Thanks for hearing me vent a bit today. 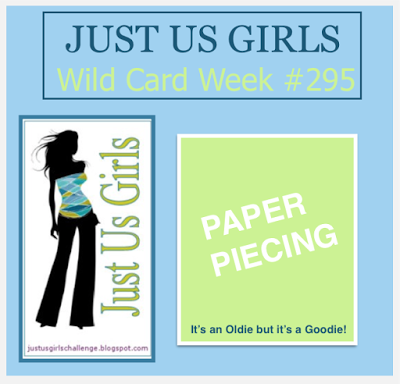 I whipped up this quick card for the Fusion Card Challenge and for Simon Says Stamp's Wednesday Challenge to use stencils. 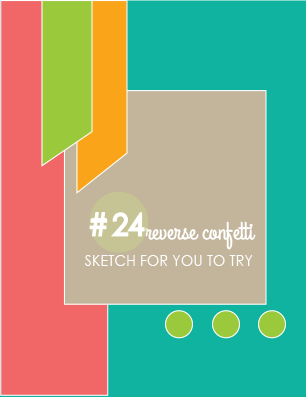 I flipped the sketch to a vertical orientation and took inspiration from the colors in the photo. 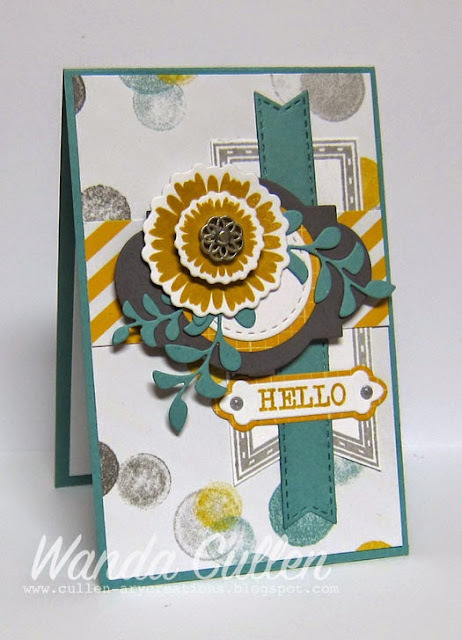 The background was sponged with Berrylicious ink from MFT using SSS Circle Dots stencil. 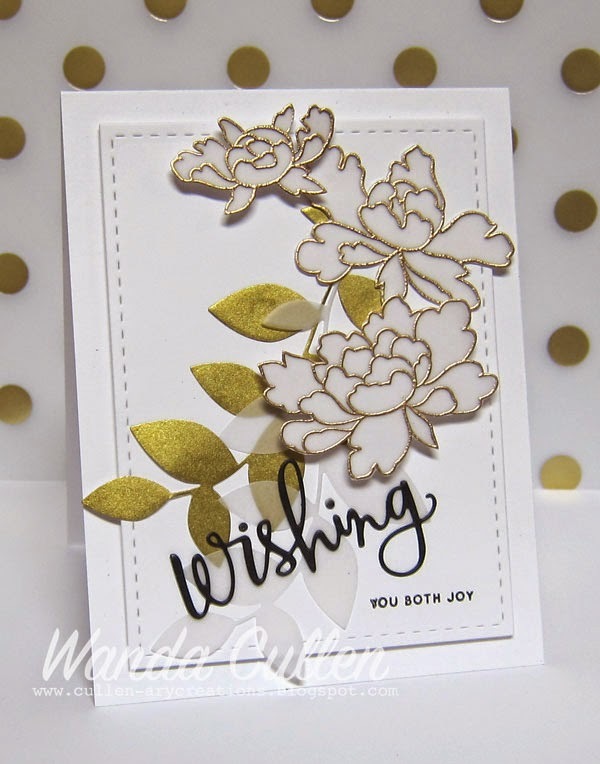 STAMPS: Sending and Wishing (SSS), Pretty Little Peonies (WPlus9). PAPER: Moonlight DP (SU), Lost Lagoon (SU), Whisper White (SU). INK: Berrylicious (MFT), Hello Honey (SU), Baked Brown Sugar (SU), Beanstalk (WPlus9). ACCESSORIES: Stitched flag dies by Reverse Confetti, Pretty Little Peonies dies by WPlus9, Wishing die by SSS, Circle Dots stencil by SSS. Hey, hey, hey...you know what day it is? It's Color Throwdown challenge day and you're going to LOVE the fabulous colors that Tammy has chosen for us! I went to my overflowing scrap paper pile and pulled out some blues and layered up a pair of stitched flags on a stitched rounded rectangle layer - two new (to me) Die-Namics from MFT! The stitched circles are by Lil' Inker designs in Chocolate Chip and white. The digi image is one of my faves from A Day For Daisies - called On Top of the World. I printed it on X-Press It Blending Card and colored with Copics. I recently bought the Hex Chart created by Sandy Allnock and wowzers...what a huge help in picking out Copic colors!! It shows you visually similar colors adjacent to each other instead of the numerically similar colors. It took me awhile to color it in, but it's SO worth it! Best $4.00 you'll ever spend if you like to color with Copics! Back to my card...I applied some Glass Bead Glitter gel by Faber Castell to the blue base using Simon Says Stamp's Circle Dots stencil. It adds such a fun and subtle hint of shine and sparkle! I fussy cut the digi image and adhered with Tombo Multi Mono liquid glue ~ an adhesive that stays out on my desk next to my glue gun all the time. 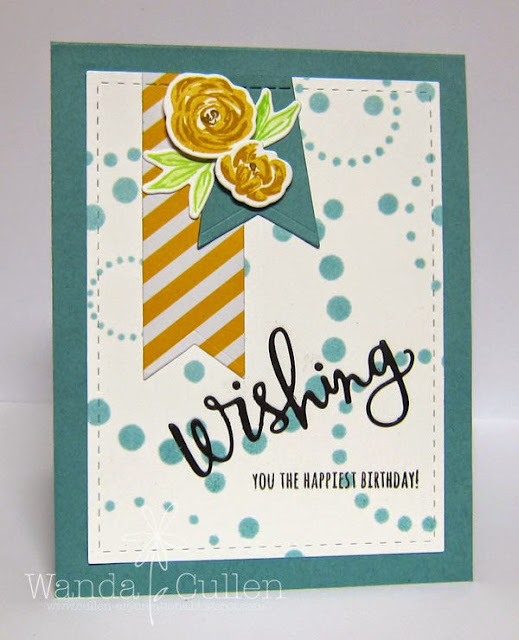 The sentiment is from SSS Circle Sayings stamp set. 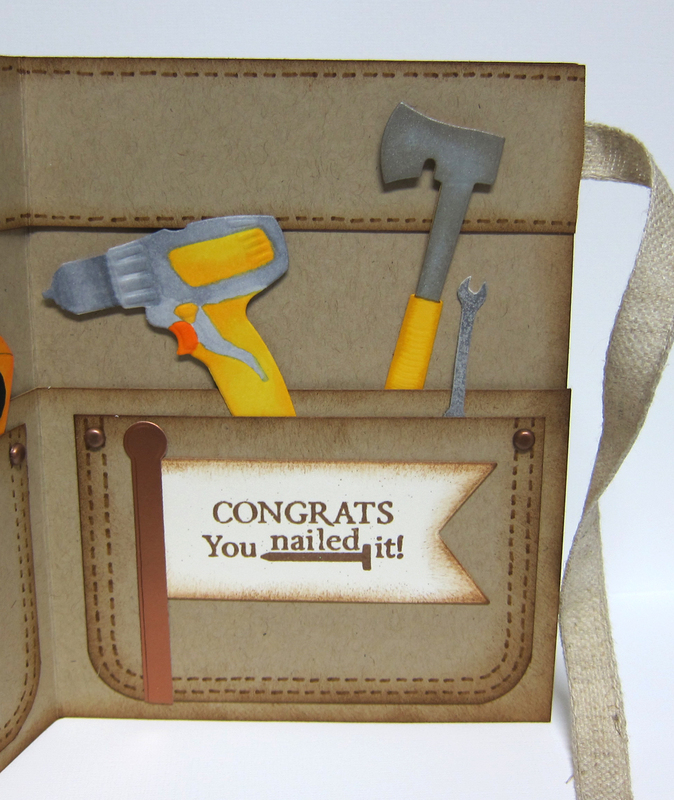 Congratulations go out to Claire from I Made This - My World of Craft who is our guest star stamper this week! The month of May is rolling by quickly and it's already time for another Mojo Monday challenge! 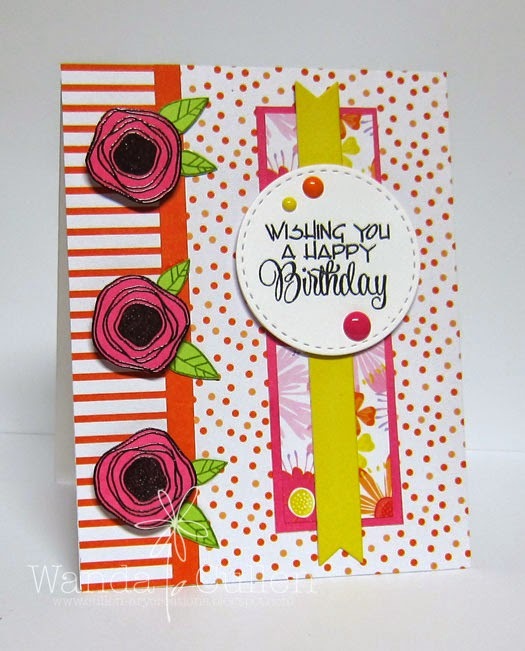 I decided to flip the sketch and use my current fave Verve flower - Poppy Birthday set - for a birthday card full of happy colors! 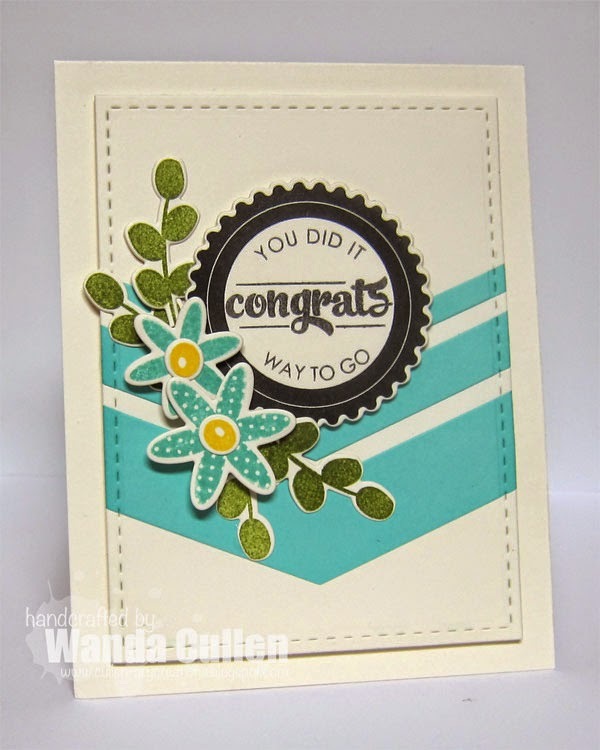 The flowers and sentiment were stamped with Versafine Onyx Black (my 'go to' black ink!) then clear embossed. 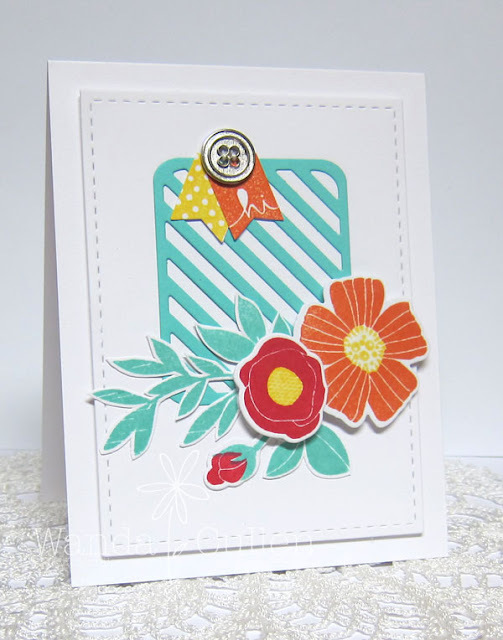 I love the crisper look I get from using the clear embossing powder! Papers are from Recollections Craft It Flora 6x6 pad. This is sadly my 4th and last day of a long weekend off! 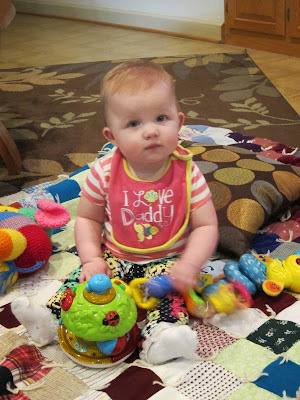 It started off with keeping this sweet little visitor on Friday night while her mommy and daddy had date night. Quinn was in a somber mood...saw the camera and seemed to be saying "You're not really expecting me to smile again, are you?" She's already using a phone - lol! At 7 1/2 months, she's sitting up well on her own (pillow is there for the occasional loss of balance) and has signs of crawling soon. Yesterday was our 40th wedding anniversary! Wow. Sure doesn't seem like it's been that long. I'm feeling very old when I crunch the numbers! 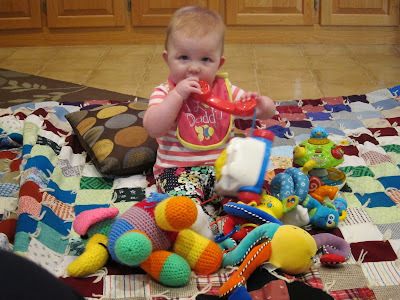 Long post today, but thanks for hanging in there with me in my proud grammy moments! I simply couldn't pass up the May flowers challenge for the Ways To Use It challenge on SCS! Normally, I use use lots of color in my creations (especially with flowers), but I'm needing to add some wedding cards to my stash, so went with white, gold and black for a more classy and formal look. I gold embossed these gorgeous peonies - Peony Scrolls by Altenew - on vellum then fussy cut and layered on another stamped peony on white CS. I popped two of the flowers with foam dots for more dimension. I die cut two Large Marianna Vine Background branches - one in brushed metallic gold and one in vellum. The sentiment is a combination of die and black embossing from Simon Says Stamp Sending and Wishing set. 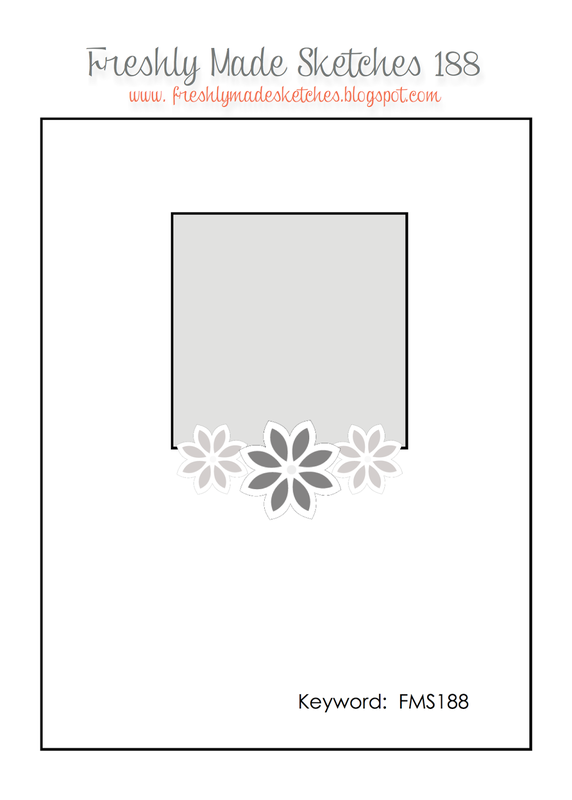 I adhered these elements to a stitched rectangle die (Lil' Inker Designs) base in white. TGIF and I'm ecstatic to have a 4 day weekend off work! Woohoo! Release! 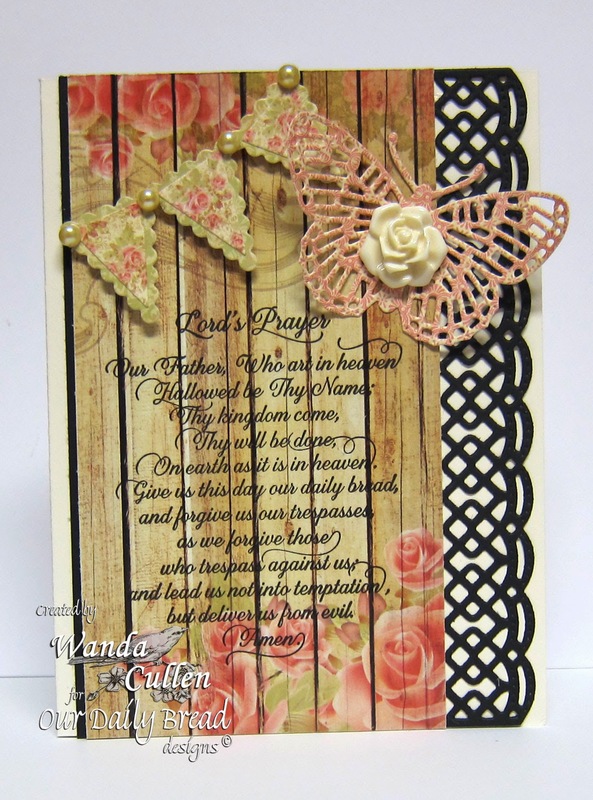 I'm featuring the single Lord's Prayer Script stamp and the Fancy Fritillary butterfly die in my project. 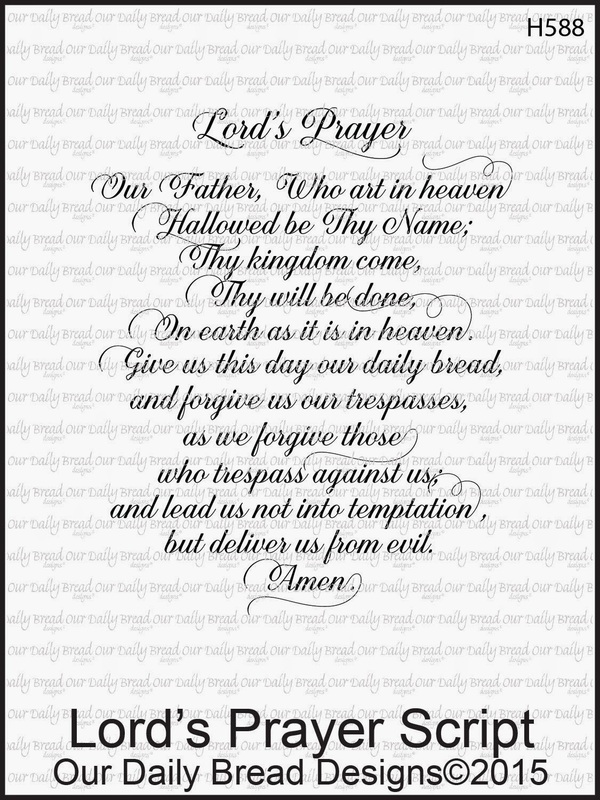 I started with one of the papers from the ODBD Shabby Rose Collection and black embossed the Lord's Prayer Script directly on the paper so I wouldn't cover up any of the beautiful design. 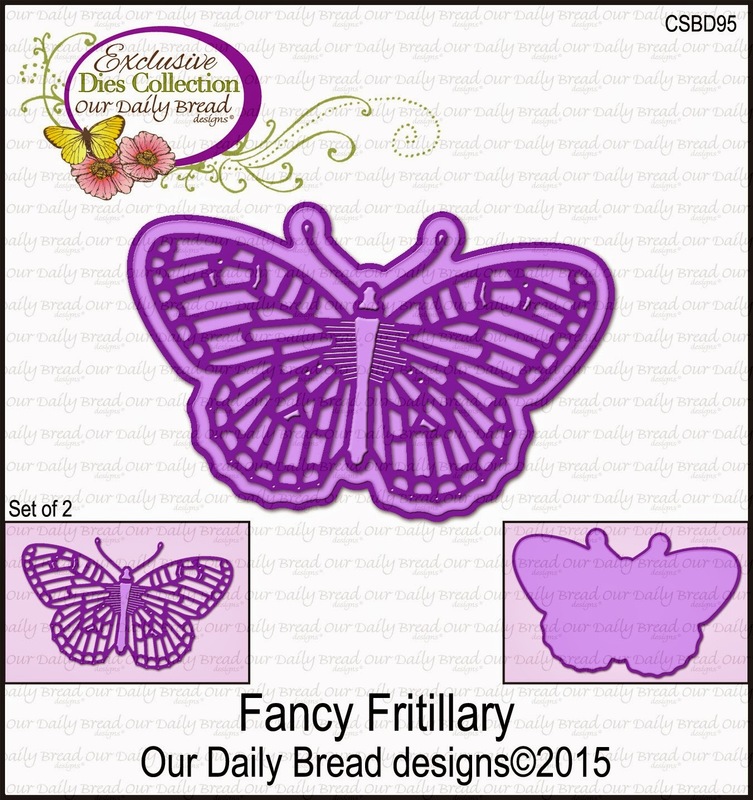 The Fancy Fritillary butterfly die and Pennant dies were also cut from papers in this same pad. I edged the panel with a ODBD Beautiful Borders Die and adhered it to a Vintage Cream card base. 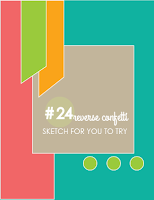 I got happy mail yesterday with some new Reverse Confetti goodies and couldn't wait to play with the awesome Sketch For You To Try sketch challenge for May! 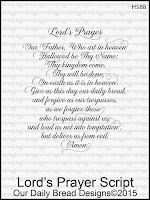 The sentiment - from the newly released God is Good set - was stamped in black and clear embossed. LOVE these flags from the new Stitched Flag Trio of Confetti Cuts! 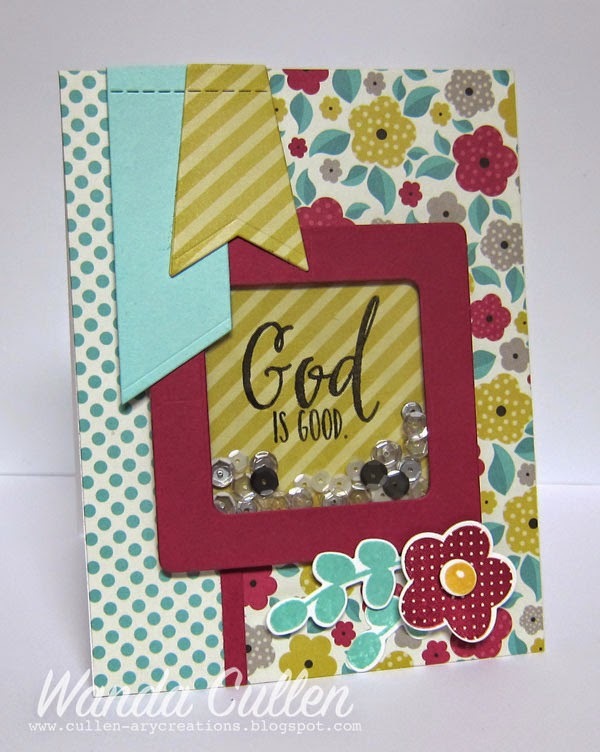 STAMPS: Petals 'N Posies (Reverse Confetti); God is Good (Reverse Confetti). PAPER: Here is Happy 6x6 pad by My Mind's Eye; Purely Pomegranate (retired SU), Pool Party. INK: Pool Party, Purely Pomegranate, So Saffron, Versafine Onyx Black. ACCESSORIES: Stitched Flag Trio Confetti Cuts, Shakers 'N Frames Confetti Cuts; Sequins. 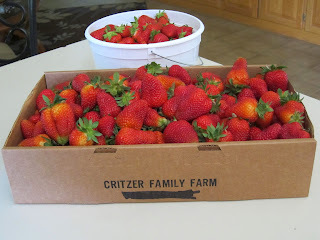 I'm headed off to work...taking some fresh new strawberries along for a snack! Picked them this morning! (hehehe...picked the flat box up off the table).